Allergan Brilliant Distinction Reward Points Accepted! Mansfield Cosmetic Surgery Center has been successfully performing Juvederm® dermal injections since 2008 to clients living near Mansfield, Arlington, and Fort Worth. Dermal filler injections are performed as in-office procedures to improve the appearance of lines and fold around the mouth and nose or improve soft tissue volume to the cheeks and lips with results typically lasting months to years — depending on the product selected and personal client circumstances. 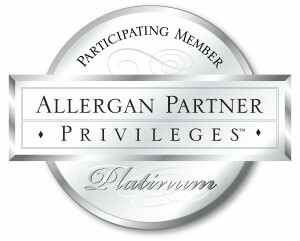 Our office is a proud participant in the Allergan Brilliant Distinctions Program. This program allows you to earn points each time you receive BOTOX® Cosmetic injections or dermal filler products from Allergan. Once you earn reward points they can be redeem for future savings and discounts at the point of sale. Our office will gladly assist you in creating a personalized Brilliant Distinctions account. Dr. Michael L. Thornton, a double board certified cosmetic surgeon and Diplomate of the American Board of Cosmetic Surgery, personally performs all dermal filler injections. 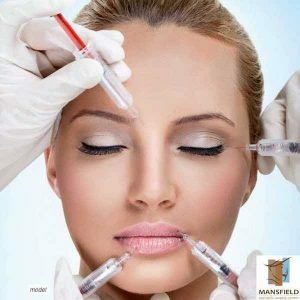 Mansfield Cosmetic Surgery Center offers Juvederm® Ultra Plus XC, one of the most popular dermal fillers used world-wide, that is infused with lidocaine (local anesthesia) to minimize discomfort during and after the procedure. Juvederm® injectable dermal filler is specifically used to restore volume and fullness for the correction of moderate to severe facial wrinkles and folds. The most commonly treated wrinkles are those around the nose and mouth, known as the nasolabial folds (NLF), marionette lines, and oral commisure lines. Juvederm® is also an excellent option for clients wishing to have plumper and more youthful appearing lips. Most recently Allergan introduced Voluma®, a highly specialized dermal filler with ultra-crossed linked hyaluronic acid, that is used for improvement in age-related volume loss of the midface, cheeks, tear trough and zygomatic arch. In addition, Allergan introduced Volbella® that is used for minor improvement in lip volume and Vollure® that is used for improvement of nasolabial folds. No matter where you need age-related volume correction, Dr. Michael Thornton will provide you with the specific product suited just for you. Juvederm® XC injectable dermal fillers are specifically used to restore volume and fullness for the correction of moderate to severe facial wrinkles and folds. The most commonly treated wrinkles are those around the nose and mouth, known as the nasolabial folds (NLF), marionette lines, and oral commisure lines. Juvederm® XC is also an excellent option for clients wishing to have plumper and more youthful appearing lips. Voluma® is specifically used for improvement of volume loss to the midface and cheeks that may last up to two years. Volbella® is specifically formulated for injection in to the lips and superficial lip lines. The syringe come in 0.55 cc and is ideal for small volume improvements.